I guess my first fascination with problems of Time, Speed and Distance began when I first saw Henna. An important part of the story line if you can call it that, saw Rishi Kapoor floating from India to Pakistan without drowning. I remember arguing with my friends that if could float for that long – he could swim back to India as well. My friends nullified the argument by saying: Speed River > Speed Rishi Kapoor I know that the reference is a little dated for most readers of this post, but Zeba Bhaktiyar made me look beyond reason. In this post we will discuss some of the ideas that have helped me solve TSD problems without forming too many equations. If the distance covered is constant (in each part of the journey, then the average speed is Harmonic Mean of the values. If the time taken is constant (in each part of the journey then the average speed is Arithmetic Mean of the values. If the various speeds which are mentioned are in AP, then the corresponding times taken will be in HP. If the various speeds which are mentioned are in HP, then the corresponding times taken will be in AP. Let us use these ideas to solve couple of quant questions. Note: Arun Barun Kiranmala is a 1968 Bangladeshi film. Now you can guess what inspires CAT question setters. Solution As you can see that the speeds are in HP, so we can say that the times taken will be in AP. Time difference between Arun and Barun is 2 hours, so the time difference between Barun and Kiranbala will also be 2 hours. Hence, Kiranbala started 4 hours after Arun. Eg 2.2 Rishi Kapoor can swim a certain course against the river flow in 84 minutes; he can swim the same course with the river flow in 9 minutes less than he can swim in still water. How long would he take to swim the course with the river flow? Let us say that two bodies ‘a’ & ‘b’ start at the same time from two points P & Q towards each other and meet at a point R in between. After meeting at R, ‘a’ takes ta time to reach its destination (Q) and ‘b’ takes tb time to reach its destination (P); then. Note: The same formulae will be valid if two bodies ‘a’ & ‘b’ start at different times from two points P & Q towards each other. They meet at a point R in between after travelling for ta and tb time respectively. After meeting, they take the same amount of time (‘t’) to reach their respective destinations (Q & P). I hope that these ideas will help you reduce the number of equations that you form while solving TSD problems if not completely eliminate them. 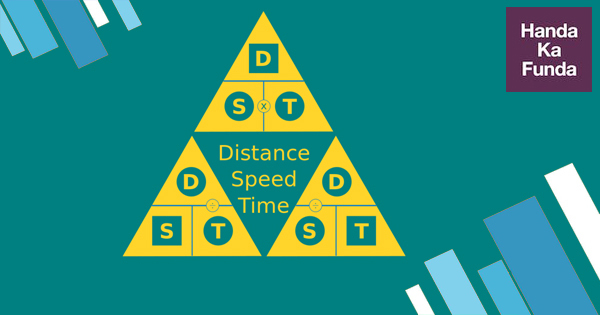 Quantitative Aptitude – Arithmetic – Time, Speed and Distance – Q1: A motorbike leaves point A at 1 pm and moves towards point B at a uniform speed. Quantitative Aptitude – Arithmetic – Time, Speed and Distance – Q5: A man leaves his home and walks at a speed of 12 km per hour, reaching the railway station 10 minutes after the train had departed.